Throughout the modern history of UBC Botanical Garden, rhododendrons have been a high collection priority. The Garden began propagating rhododendrons in 1964 with the majority of the material for propagation derived from larger estates and gardens in the UK. Peter Wharton joined the staff of the garden in 1975 and was assigned to the continued development of the Asian Garden. Initially, the garden’s collections were derived in large part from the then sizeable storehouse of rhododendrons at the Botanical Garden Nursery, but it was not long before Wharton’s own Far Eastern seed collections and those of an ever-expanding network of botanical gardens and collectors began to be planted out. Peter spent more than 30 years developing the Asian Garden and he led or participated in nine field and seed collecting expeditions to China, South Korea and northern Vietnam. Both in terms of numbers of taxa and overall beauty, rhododendrons have always been the backbone of the Garden. With the predominance of high, overhead shade, the larger leafed and taller growing rhododendrons are well represented. Some areas of the Asian Garden were initially heavily planted with the smaller lepidotes (scaly leaved rhododendrons), such as R. impeditum, R. luteiflorum and the ground hugging R. campylogynum and their relatives, but the more exuberant growth of surrounding plants tended to crowd them out and reduce the number of areas in which these smaller plants could be grown. Only in the more open E. H. Lohbrunner Alpine Garden do the smaller-leafed, sun-loving rhododendrons remain in their ascendency. There are particularly fine examples of the ravishingly purple R. canadense and the perfect, aromatic miniature R. lapponicum in the North American area, R. ferrugineum in the European section and a small number of other non-Asian species displayed in the Alpine Garden. However, as one would expect, Asian rhododendrons, primarily species and selections from Japan, the Himalayas and the mountains of western China (Asia is where the genus reaches its greatest diversity), are among the real jewels here. British Columbia also has its share of Rhododendron species and the BC Rainforest Garden is where visitors can find a number of examples of R. macrophyllum and all three Labrador tea (formerly Ledum) species, R. palustre, R. neoglandulosum and R. groenlandicum. 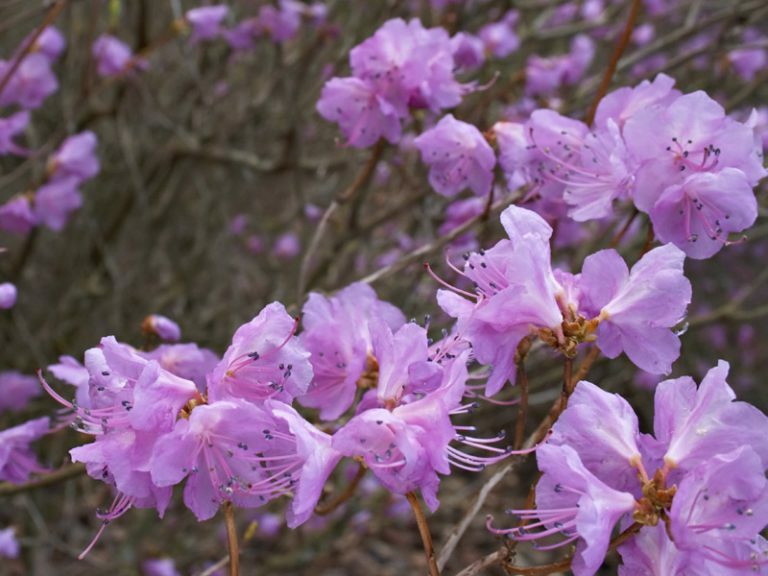 Cultivated in the Carolinian Forest Garden are wild-collected rhododendrons, including R. catawbiense, R. maximum, R. minus, and the deciduous R. canescens, R. arborescens, R. vaseyi, R. prinophyllum and R. calendulaceum. The majority of these species were collected as seed from the remarkably bio-diverse southern Appalachian Mountains. Nitobe Memorial Garden is also home to a number of Rhododendron taxa, although these plants have never been part of the garden’s collections database. Like the Asian Garden, Nitobe was carved out of a natural second-growth stand, here composed primarily of tightly spaced Tsuga heterophylla (western hemlock) and Pseudotsuga menziesii (Douglas fir). This forest of straight stems and dark green foliage is the background to a restful landscape where shrubs, including a number of evergreen azaleas, have been clipped into homogeneous undulating masses, in accordance with a Zen Buddhist garden design philosophy that eschews displays of exuberance by foundation plants, thus creating contemplative surrounding spaces on which to rest the eyes. The Garden’s rhododendron collection is extensive. In total, the various areas of the Garden share approximately 450 Rhododendron taxa. All but two hardy subsections of subgenus Hymenanthes are represented (subsection Venatora and subsection Griersoniana are missing) and there is a wide selection of lepidotes (subgenus Rhododendron) and azaleas (various subgenera), although these collections are less complete, reflecting both the dearth of sunny, well-drained areas available and the somewhat traditional focus on larger rhododendrons for woodland planting. The Garden is not particularly well-endowed with respect to conventional hybrids. The greatest concentration of hybrids was in an area near the Botanical Garden Nursery, which is now demolished and was generally off-limits to garden visitors. Notwithstanding a few exceptions, this reflects the prevailing attitude in botanical gardens about the value of hybrids relative to species and other naturally occurring taxa, and especially to collections of known wild provenance. The range of Rhododendron taxa cultivated in the garden includes those derived from the more familiar and stalwart groups, such as subsections Fortunea, Saluenensia, Triflora and Pontica, as well as examples of many less well-known groups, i.e., subgenus Tsutsusi section Brachycalyx (the so-called three-leaf azaleas) and subgenus Hymenanthes section Pontica subsection Glischra (including the unusual R. glischrum subsp. rude, R. crinigerum and the more familiar R. recurvoides). The garden has a few plants that are rare in cultivation, such as R. fulgens, R. cyanocarpum, R. uvarifolium, R. ochraceum and R. yuefengense. From the horticultural perspective, there are several locally significant plants in the garden (i.e., originating in the Pacific Northwest), such as the hybrids, R. ‘David Lam’ and R. ‘Olympic Lady’, and R. praevernum “Del James selection.” Also prominently displayed are selections of species widely recognized as “superior,” such as R. augustinii ‘Barto Blue’, R. parmulatum ‘Ocelot’, R. argyrophyllum ‘Chinese Silver’ and a range of Japanese R. indicum and R. kiusianum cultivars. 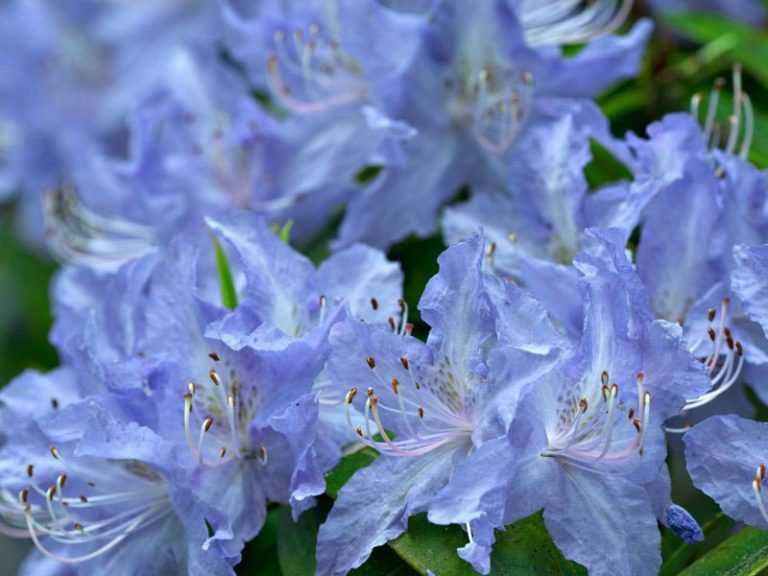 Ultimately, the garden’s rhododendron collection is less about “stamp collecting” and more about growing the widest range of plants that both hold some justifiable significance and suit the conditions in the garden. Still, with new rhododendron acquisitions (as well as with acquisitions of all other kinds of plants), the garden is mainly interested in wild seed collections of known provenance. Rhododendrons in the Asian Garden are loosely arranged according to subsection, with some areas easily identifiable by these groups. For example, the Himalayan R. arboreum, its various subspecies, varieties and forms, and its close relatives (e.g., R. niveum, R. lanigerum) and the western Chinese R. argyrophyllum and its relatives (including R. floribundum, R. denudatum, R. rirei and R. thayerianum) are primarily located near the garden entrance. Moving east, the triflorums, such as the richly violet-coloured R. concinnum, pink R. davidsonianum and the mauve, sapphire and sky-toned seedlings of R. augustinii, form elegant thickets, and are commonly planted near large conifers. A number of accessions of the yellow-flowered, lance-leafed R. lutescens are planted throughout the Asian Garden, displaying much of the range of flower size and colour, phenology (time of flowering), leaf shape and cold hardiness that is inherent in this species. Specimens in the subsection Taliensia are mostly located mid-garden along Upper Asian Way in an open, mostly unshaded area. Many people recognize the thickly fuzzy leaves of the typical R. bureavii, but taliensias are also often less teddy-bearish, with a number displaying unusual leaf features and textures, such as the glaucous, convex-leafed R. clementinae, the bristly stems and narrow, rusty wool-backed leaves of R. roxieanum, the weirdly patchy indumentum of R. aganniphum var. flavorufum, or R. wiltonii, a reptilian delight with its glossy, bullate upper leaf surface. Many species are surprisingly glandular and aromatic and the faint smells of camphor, licorice, peach and sandalwood mix and linger in the area. Standouts in this respect include R. wasonii, R. trailianum and R. faberi, but admittedly, not every visitor is keyed into these subtle aromas. 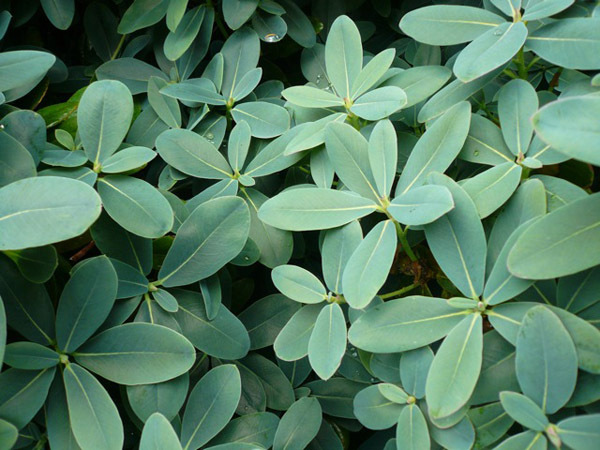 These shrubs are almost all so attractively shaped and the leaves dressed in such handsome shades and textures of indumentum that one hardly cares if the plants produce a bloom. However, they mostly do and those flowers are often delightful. Aromatic rhododendrons are of course not limited to the taliensias. A number of lepidotes are notable for their various odorous emissions, including the triflorums and many of the small-leaved species, but the cinnabarinums take the prize for the most aromatic of the larger lepidotes. The Asian Garden has a small number of both wild collections and cultivated selections, including a spectacular planting of the waxy, grey-green-blue-leafed R. cinnabarinum subsp. xanthocodon Concatenans Group along Kingdon Ward Way. Given the extraordinary colour and texture of the foliage, one hardly requires flowers, but the lax, Dijon mustard-coloured bells of this rhododendron are improbably attractive. The smell of these and the other cinnabarinums nearby is a heady mixture of camphor and clove oil and can occasionally induce a headache in some people if they stay too long in the vicinity. Large leafed rhododendrons are well represented in the Asian Garden. Some of the more notable with respect to size and number include the summer flowering, honeysuckle-scented R. auriculatum (subsection Auriculata), R. kesangiae (subsection Grandia) with its paddle-like, glossy, heavily textured leaves, the flashing, burnt orange undersides of R. fulvum (subsection Fulva), and the hardier species in subsection Falconera—R. rex, R. arizelum, R. sinofalconeri, R. basilicum, R. hodgsonii, and R. falconeri—all of which never fail to impress garden visitors with their outsized leaves, huge flowers and tree-like stature. 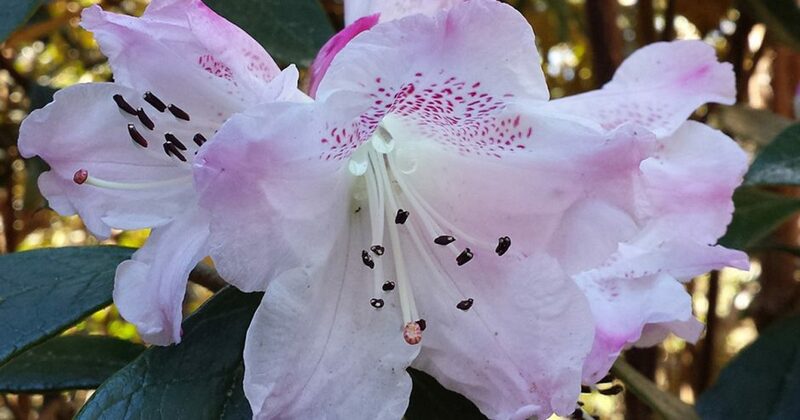 Taxa in the subsection Fortunea are among the most numerous in the garden, and are also arguably some of the toughest and most rewarding large rhododendrons that can be grown in the Vancouver area. This group includes plants that are often moderately large leafed and large flowered, and that bloom over a long season. Our specimens of R. decorum subsp. diaprepes ‘Gargantua’ are now well over 12 m tall and they tower above other huge rhododendrons. Likewise, the sweetly scented and opulent flowers of R. griffithianum, whose superlative genetics are famously displayed in the Loder hybrids, attracts considerable attention. At the western end of Lower Asian Way, garden visitors are met with a wall of 6 m high R. vernicosum plants. Continuing eastward along this path, Wharton collections of R. glandulosum and R. serotinum are now clearly showing their tree-like inclinations. Older plants of R. sutchuenense and especially the many giant R. calophytum specimens in this area help define the southeastern reaches of the Asian Garden. Of the shrubbier species, R. orbiculare is a crowd favourite. Its ample rounded leaves and bulging, hot pink bells are extraordinarily handsome, alone, or particularly together. Another standout is R. oreodoxa var. fargesii, with its abundant lax trusses of softly ruffled, pink flowers. Scattered about the garden are still more groupings, some related and others juxtaposed or separated for other reasons—shade, drainage, ultimate size, flower colour or leaf shape. Rhododendron barbatum and its kin (subsection Barbata) are located in the cooler, more shaded parts of the Asian Garden, for example, where summer temperatures are significantly moderated by marine air that filters up ravines from the ocean below. The beautiful R. campanulatum subsp. aeruginosum (subsection Campanulata) was strategically located in an area that receives plenty of sunshine to help maintain its extraordinary blue leaf wax, and near to the path so that visitors can see and feel the wonderful indumentum on the undersides of its leaves, which one staff member likens to baby beaver pelt. Even more extraordinary, the developing indumentum starts out pure white and with the texture of the inside of a marshmallow, before it gradually darkens to its final light salmon-brown. Various species of subsection Thomsonia are spread around the Asian Garden, among them the rare and beautiful R. stewartianum and R. cyanocarpum, and taking pride of place opposite the Moon Gate are three separate R. thomsonii accessions (from Nepal, Sikkim and Bhutan). At 2.5 m tall, these Himalayan beauties show manzanita-like peeling stems and rich scarlet flowers atop waxy rounded leaves. The active acquisition of plants, their study and interpretation in both the garden and the field is fundamental for any university botanical garden. The paramount objectives of the mission are community engagement, education and research. Today, the value of every plant in the garden must be rationalized in terms of our mission. Whether an accession is derived from a wild or cultivated source, its provenance and pedigree have become, along with beauty, conservation value and botanical interest, measures of its importance. Conservation concerns are obvious when considering extinction and loss of wild habitat—and critically important when considering the fates of wild rhododendrons locally and in Asia—but less obvious are the conservation challenges regarding the loss of cultivars. In this regard, the garden is committed to integrating conservation and biodiversity education, as well as recognizing “significance to horticulture” into its curatorial philosophy and programming. None of this matters, of course, if the plants can’t be grown, and the garden is committed to maintaining its reputation and stature as a place that people want to visit. Our audience includes researchers, educators and students, as well as a diverse, non-academic community whose constituents appreciate gardens for a multitude of other reasons, including the appreciation of great rhododendrons. (R. ‘Sunup-Sundown’ ´ R. ‘Lem’s Cameo’): Jack Lofthouse (1915-2005), Vancouver, BC. (R. ‘Loderi King George’ ´ R. williamsianum): Endre Ostbo (1888-1958), Everett, WA. Delbert W. James (1894-1963), Eugene, Oregon, rhododendron breeder. The Encyclopedia of Rhododendron Species. Peter A. Cox & Kenneth N.E. Cox. Glendoick Publishing. Perth, Scotland. 1997. The Life and Times of a Plantsman in the Sikkim Himalayas: A Memoir. Keshab C. Pradhan. K.C. Pradhan, Tadong, Sikkim, India. 2008. The Rhododendron Handbook; Rhododendron Species in Cultivation. Royal Horticultural Society. London. 1997. 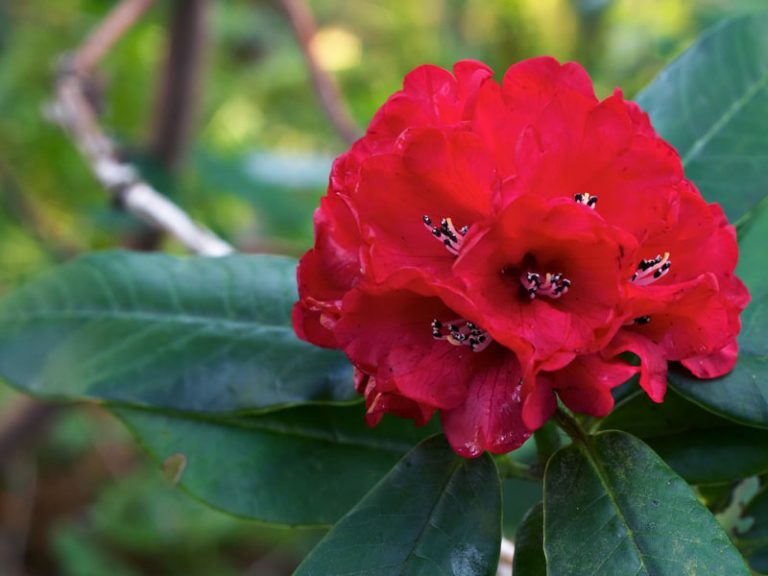 Rhododendron Hybrids; A Guide to Their Origins. Homer E. Salley & Harold E. Greer. Timber Press, Portland Oregon. 1986.